One the most revered medicinal seeds in history would be the black cumin seed. These seeds come from the Nigella sativa plant, which is native to Asia. The seeds are dark, think, and crescent-shaped. They have been used for centuries in the Middle East, the Mediterranean, and India. Black seed oil was even found in Egyptian pharaoh Tutankhamun's tomb, dating back to approximately 3,300 years ago. Today black cumin seeds are commonly used as a seasoning spice in different cuisines across the world but historically they were used for medicinal purposes. They are also known as Roman coriander, black seeds, or black caraway. They are loaded with remarkable heath properties making it one of the most powerful medicinal seeds known to man. The seeds contain over 100 chemical compounds including the primary active ingredient crystalline nigellone. 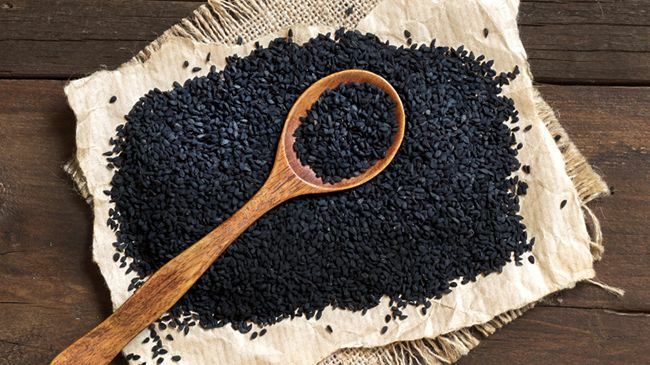 What makes black cumin so special? Nearly all of the medicinal potency comes from the essential oils while in its truest form and the oil is more effective than the seeds. The oil is loaded with cuminic acid, cymene, dipentene, limonene, phellandrene, and pinene. More components of this amazing oil would be thymoquinone, beta sitosterol, myristic acid, palmitic acid, stearic acid, oleic acid, copper, and zinc just to name a few. How does black cumin essential oil benefit hair and scalp? Black cumin seed oil stimulates hair growth and helps the appearance of split ends. The amino and fatty acids will provide a protective layer on the hair, which protect the strands and help to temporarily diminish split ends. Sealing your ends with this oil will help seal and soften them while also eliminating frizz. Black cumin seed oil is high in antioxidants like thymoquinone, which can fight off free radicals that damage your scalp and hair. The antioxidants and anti-inflammatory properties will protect your skin, hair, and scalp year-round from the dryness of winter to the scorching sun in the summer. Those same anti-inflammatory properties help calm rashes and inflammations that affect the scalp like eczema and psoriasis. Not only healing the scalp, this rich oil will soften and condition your hair. Black cumin seed oil and coconut oil together can stave off dryness on your entire body. Just take 1 teaspoon of black seed oil and 1 cup of coconut oil and massage over your entire body once a week for smoother skin instantly. Use the mixture to massage on your scalp to do the very same thing. You can also use this to create a potent hot oil massage. Warm 2 tablespoons of the oil, massage into your scalp, and rub the remaining oil into your hair. Leave it on for 15 minutes before rinsing out thoroughly with warm water. There is no need to shampoo after this treatment. The oil is great alone or coupled with other oils for superb DIY treatments. We have one below for your scalp, but if you prefer using products with stellar ingredients we have some below as well. Mix ingredients well before applying the mixture to your freshly washed hair and scalp. Cover your hair and let the treatment set for 30 minutes before shampooing and styling as usual. This soothing treatment will calm your inflamed scalp while fighting off dandruff and eczema. It can be used anywhere skin conditions occur on the body.